"Judge" Aaron Hackney was not a judge, but as a frontier newspaperman he often set himself up as one. He was the founder of Globe, Arizona's famed Arizona Silver Belt in 1878. In the pages of the paper can be found colorful stories of Globe's early days, the exploits of Geronimo, and many other exciting early Arizona tidbits. Judge Hackney's most treasured dream was to bring the railroad to Globe. He was able to see that fulfilled in December 1898. 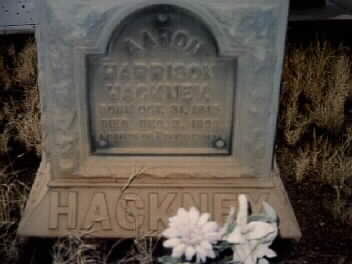 Judge Hackney died a year later.